A look back at the 2013-14 golf season --- one of the finest ever despite not winning the national championship with a disappointing tied for 3rd finish. See full details at http://www.stanfordmensgolf.org/Recap2013-14.htm. The Cardinal completed one of its most successful seasons ever despite a disappointing final result, a tie for third in the National Championship held at Prairie Dunes GC in Kansas after earning the #1 seed. A number of team and individual records were set in the process of winning 7 of the 12 stroke play events played. The 2013-14 team was led by two outstanding players who finished their careers as two of Stanford's finest collegiate golfers, junior and national player of the year Patrick Rodgers and winner of the National Championship, senior Cameron Wilson. A strong supporting cast was led by sophomore David Boote and three freshmen, Maverick McNealy, Viraat Badhwar and Jim Liu. Patrick Grimes, Shane Lebow and Keegan English rounded out this great team. All contributed to the success of one of the best teams Stanford ever had. The team and individual records and highlights are first shown below, followed by the player scoring summary and the individual tournament results. Lastly are the preceding summer tournament results. 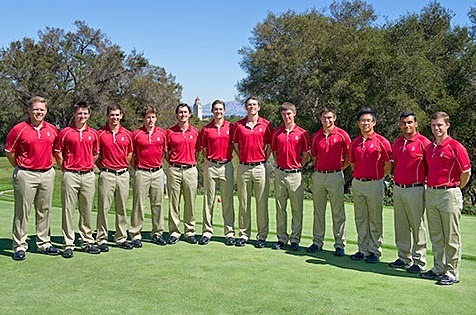 See full details at http://www.stanfordmensgolf.org/Recap2013-14.htm.